Terron Armstead thoroughly handled the veteran Terrell Suggs in this one. The Saints left tackle didn’t allow a single pressure all day and did work on the Ravens’ linebackers in the run game. Drew Brees outperformed his stat line in this one, as he simply wasn’t missing on his targeted passes. The Saints quarterback was accurate on 24 of his 27 targeted passes on the day. Marshon Lattimore had easily his best game of the season, as he was targeted six times and only allowed one catch for 11 yards (although he also added a pass interference penalty). He broke up three of those six targets and could have had two picks on the day if it weren’t for drops. David Onyemata quietly had one of the best pass-rushing days of his career. He only registered two pressures but could have had a handful more if it weren’t for Joe Flacco‘s quick release. 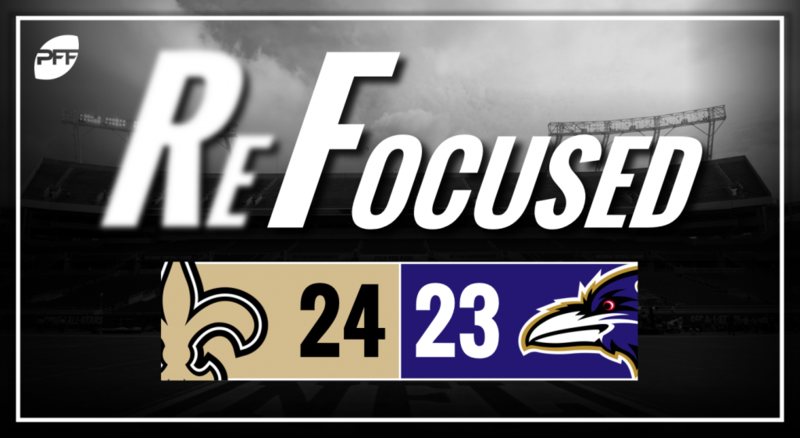 The Ravens’ inability to affect Brees’ throws really showed itself down the stretch. They only got pressure on six of his 31 dropbacks on the day. Jimmy Smith has not looked like the same player we saw a season ago since returning from injury. He allowed a touchdown and only one of his six targets fell incomplete. Sunday was not Willie Snead‘s day by any means. He only hauled in three of his seven targets with two of those falling to the ground via drops. Snead also had a chance to haul in a crucial fourth down conversion midway through the fourth quarter but couldn’t hang on against his old team. Forced into his first career start, Orlando Brown Jr. was given plenty of help on the right side with chips coming from running backs and tight ends against Cameron Jordan to make sure he didn’t ruin their offensive gameplan. It worked fairly well, and even on the handful of reps Brown went one-on-one, he didn’t look completely out of his depth. Lattimore getting back to his dominant self is a great sign for New Orleans. Their pass-defense needs all the help it can get at the moment. Justin Tucker missing the first extra point of his career is easily the most shocking takeaway from the Ravens in this one.